Cherry Grove Villas is an enclave of North Myrtle Beach condominiums that are luxuriously inviting. These second-row North Myrtle Beach vacation rentals are spacious and full of all the things that help make a North Myrtle Beach rental stand out from the crowd. 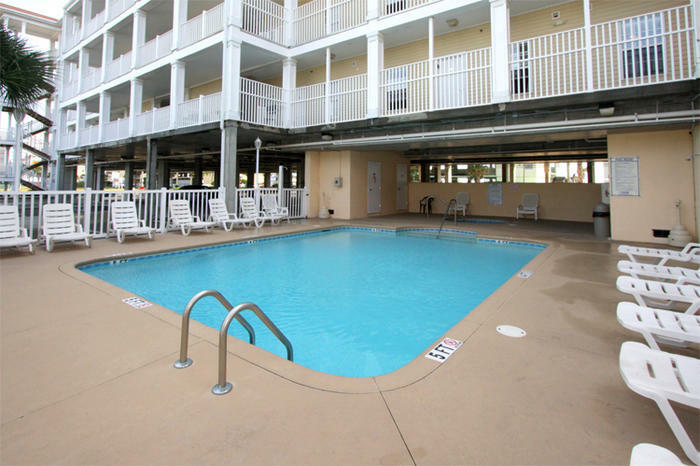 Though the Atlantic Ocean is right across the street from Cherry Grove Villas, there is a beautiful blue swimming pool and hot tub on site so you never have far to go for some water recreation when you vacation at this North Myrtle Beach resort. The interiors of these North Myrtle Beach vacation rentals make grand, welcoming gestures that are sure to pique the interest of everyone in your party. There are many North Myrtle Beach condominiums from which to choose and all are fabulous. These North Myrtle Beach rentals range in size from a one-level, four-bedroom, three-bath condo that sleeps 10 to a two-level, six-bedroom, five-bath vacation rental that accommodates 20. You will definitely find first-class sophistication with small seaside village charm at Cherry Grove Villas. Brighten your North Myrtle Beach vacation with reservations for one of these four-, five- or six-bedroom condominiums in North Myrtle Beach, South Carolina. The end units at this North Myrtle Beach resort are especially bright because they feature more windows than the interior North Myrtle Beach rentals at Cherry Grove Villas. The great room in each of these condos in North Myrtle Beach, SC is an open floor plan that incorporates the living room and the extra-accommodating dining area. The kitchen boasts full-size appliances that include a dishwasher in addition to all the small appliances that make a North Myrtle Beach vacation one of total convenience: toaster, microwave and coffee maker. The living room of each of these North Myrtle Beach rentals opens to the ocean view balcony. You can glimpse the Atlantic Ocean from the furnished balcony, feel the sea breezes and bask in the warmth from the North Myrtle Beach sunshine. The master suite in each of these North Myrtle Beach vacation rentals has balcony access, too. Sleep with your balcony doors open slightly so you can hear the sound of crashing waves through the night. In the five- and six-bedroom North Myrtle Beach condominiums at Cherry Grove Villas there is a second balcony for your family and friends to enjoy. And another bedroom in addition to the master suite has balcony access in those North Myrtle Beach vacation rentals. Look for flat-screen televisions, numerous DVD players, ceiling fans, washing machine and clothes dryer in each of these North Myrtle Beach rentals. At least one Jacuzzi tub is typically among the amenities of these North Myrtle Beach condo rentals. The bathrooms are large at Cherry Grove Villas when they feature a Jacuzzi tub and a separate shower. High-speed Internet access is available in each of these condos in North Myrtle Beach, SC so you can peruse restaurant menus, Myrtle Beach golf course tee times and store hours without ever leaving the luxurious comfort of your North Myrtle Beach rental. Some of these North Myrtle Beach vacation rentals have tile floors, granite countertops and more than 3,000 square feet. You can even find North Myrtle Beach vacation rentals at Cherry Grove Villas that have a game room with a pool table or video games. Your family will be living large in these lush North Myrtle Beach rentals. Furthermore, the bright blue swimming pool and hot tub are right downstairs from your luxurious North Myrtle Beach vacation rental. Take your beach towel to the pool and go for a dip or dangle your feet in the refreshing water while you read another chapter of your favorite book. Hop in the hot tub when your muscles are sore from golf and your feet ache from shopping. What therapy the hot tub is at Cherry Grove Villas! Seeing the Atlantic Ocean is a daily delight when you vacation at Cherry Grove Villas. Get a feel from the ocean when you step onto your ocean view balcony. And to become a part of the beachfront landscape in the Cherry Grove section of North Myrtle Beach, SC you just have to walk across the street. Seashells, sand castles, oceanfront sunrises and surf that begs you to go swimming are all at your fingertips when you stay at the second-row North Myrtle Beach resort of Cherry Grove Villas. Take it easy on the white sandy beaches and experience inspired living at the beach. You will love the accommodations, the amenities and the close proximity to all the fabulous features of Myrtle Beach!